In a controversial editorial over the weekend, the Colorado Springs Gazette called on all Republicans, large and small, to exit the gubernatorial race, with the exception of Colorado Treasurer Walker Stapleton, whom the newspaper believes has the best shot of beating the Democratic candidate in November. The Gazette was particularly hard on former Congressman Tom Tancredo, who’s the GOP front runner in the primary race. “It is a deal killer,” the Gazette editorial stated. But The Denver Post’s John Frank reported in November that Tancredo had removed himself from the VDARE board shortly after he launched his gubernatorial bid. The Post’s Chuck Plunkett went further, writing that Tanc said he didn’t fully understand what VDARE was and had goofed by joining the board. In an interview Wednesday, Tancredo said he resigned from the VDARE board, which he’d joined in name only for just a few months, because it would be a distraction during his campaign, not because he has a problem with the group. 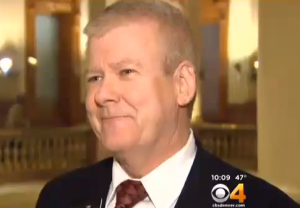 In Colorado, VDARE has also been defended by State Sen. Tim Neville, a Republican from of Littleton. Last year, Neville went so far as to accuse Colorado Springs Mayor John Suthers of “dereliction of duty” for refusing to provide support for the VDARE conference that was cancelled the previous month. The GOP’s refusal to stand up for VDARE inspired Tancredo to first consider his gubernatorial run. VDARE has been linked to the rally of white supremacists in Charlottesville, in part because a VDARE writer helped organize it. Tancredo is such a liar. A simple search on youtube (Tancredo VDARE) yields a lengthy 2-part interview on VDARE TV. So it's not true that Tancredo "didn't fully understand what VDARE was and had goofed by joining the board." The online web page of VDARE has about 800 results for Tom Tancredo. If he "doesn't read their articles", that would be odd, because he's mentioned in about 800 of them, going back to 2002 or so. The content of these articles is standard Tancredo fare: All immigrants are bad, but Mexican and Muslim immigrants are dangerous to the (white) American way of life. VDARE does have this lovely take on an interview by 9News Brandon Rittiman with Mike Coffman, whom VDARE calls a “Cuckservative”. Remember when Mike Coffman said that he wanted to run against Tancredo? VDARE does. It is great that the GOP is becoming so welcoming to those with disabilities. As far as I can see, those with cognitive deficits ("I didn't know what the group was when I joined their board") and memory problems ("I don't recall that word being used") are welcomed with open arms, even encouraged to run for office.